To configure and make Addictive Drum(AD), VSTHosts(VH) or the lighter Savihost(SH) togheter with MegaDRUM(MD) and MegaDRUM Manager (MDM) require some knowledge. I have tried to collect my experince setting up these systems to work in optimal way. To send midi note information from your MegaDRUM Device(MD) to VSTHosts please select MegaDRUM Midi Port 2 in VSTHosts. (Main menu – Midi) You can now use the MegaDRUM Midi Port 1 for MegaDRUM Manager (MDM) at the same time and be able to patch your settings as you hear them in MDM. The ports are equal! Please select soundcard in VSTHosts – You should be able to see your sound card. ( main menu -devices and then audio) Please use a ASIO driver from your sound card vendor (Asioall drivers will make you depressed) to get the optimal performance and lowest latency. 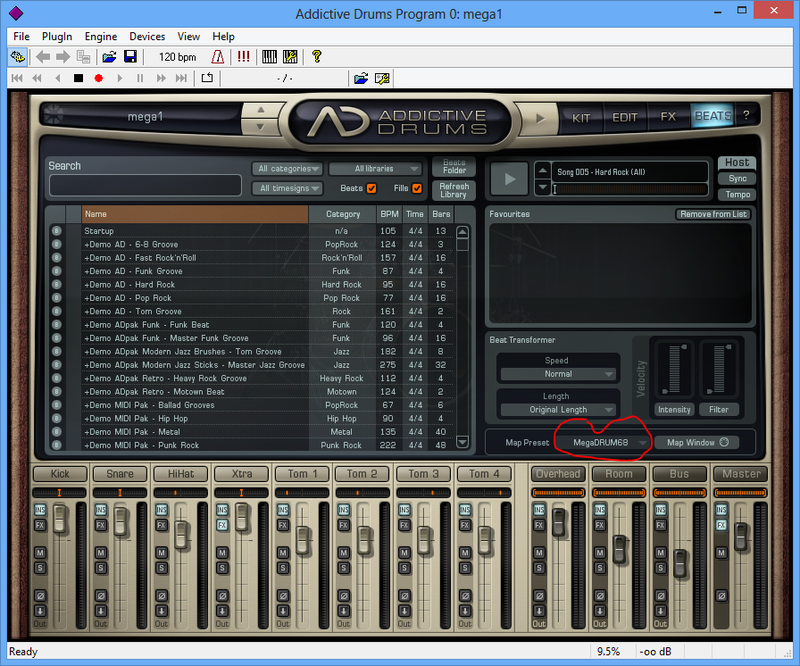 You can use my settings MegaDRUM55.ADMap and drag that to the \documents\addictive drums\user maps\. So just place the ADMap file here…You will then be able to see this midimap in AD/BEATS dialog and you can select your preset under AD Map Preset. In MDM load my megadrum55.mdm file. 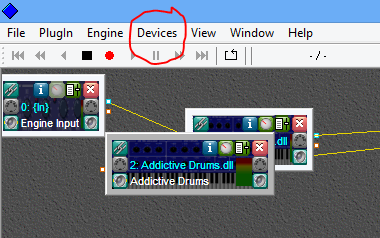 You will see note mappings for all the drums…so steal one of the drums note settings. For an example the snare…where the head trigger use note 38. Use 38 for all note entrys and use it on your working input channel. Save it to MegaDrum. Recommendation…if you want a very straight forward VST host client and only use one DRUM plugin, you can use the light version of VSTHOSTs called SAVIHOSTs. In this case you search for the location of your drumplugin dll file. Copy the savihost.exe to this directory and then just rename the savihost.exe to the actual VST.DLL name, example: If the dll is named ad.dll rename the savihost.exe to ad.exe. When executing the AD.EXE…the plugin will be loaded directly. Pretty neat! go in to Addictive Drums BEAT page. Click on the XTRA A sound and see which midi note it is assigned to. (on my system I get note 47) You will see the note value in midi monitor on “IN” in the bottom of the dialog. remember that note value and enter it into the note data for the aux port 1 data in MegaDRUM Manager. Save it to MegaDRUM done!